Set in dark and shadowy venues or spooky old mansions, the early horror movies were often as comical as they were scary. 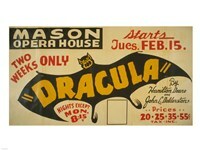 These vintage horror movie posters embody the spirit of the time and have a very artistic, gothic look. "We are in Transylvania, and Transylvania is not England. Our ways are not your ways, and there shall be to you many strange things."